Today we look at mutton chops; also sometimes called side curtains or side whiskers. This look is achieved when the sideburns are grown out along the jaw until the corner of the lip; although sometimes they may be shorter. The chin is usually bare and it can be worn with or without a moustache. This style was made popular again by Hugh Jackman’s character Wolverine and since then many men have tried them out – let’s have a look. No matter how you look at it beards are trendy and here to stay. However, with so many different styles it can be hard to decide what works for you. In this picture, the gentleman’s hair has been grown out from the sideburns down to the chin. The hair on the tip of the chin is much shorter and separates one side from the other. Here we see neatly trimmed mutton chops that have been teamed with a moustache. The moustache is also clipped short and sits snugly above the lip. His mutton chops have been allowed to grow out and he has a few splashes of silver in this beard. The moustache has been trimmed and is a little shorter than the rest of the facial hair. His beard is quite bushy which looks great with his thick curly hair. He is wearing a moustache as well, which just reaches the top lip. In this look, his chin is completely open and we can see a small soul patch under the lip. His mutton chops are smartly trimmed and he has a very thin moustache. He has grown a long thin moustache that he is wearing with short mutton chops. You can just see that they are separated from each other. These mutton chops only begin from the very edge of the face and have been grown out and snipped to have a rounded shape. Here you can see how the mutton chops and sideburns have been trimmed to have a nice clean cut edge. His mutton chops have been allowed to grow out slightly which ties in nicely with this tousled hairstyle. He is also sporting a clipped moustache. Here the facial hair stands out quite attractively as he has a very short skin fade on the sides of his head and the rest of his face is clean shaven. He has grown out his mutton chops from the edges of his lips and the hair is thick and bushy, creating a contrast with his shaved head. In this picture his shaggy, but well maintained, mutton chops are joined by a small soul patch and a handlebar moustache. In this picture, you can see how his beard has been allowed to grow out under the jaw and how the style is matched with a separated moustache. These mutton chops are being kept smartly clipped and they join together with a trimmed moustache. In this picture, the beard has been squared off and are separated from the beard on the chin and the moustache. In this picture, we can see that the face is shaved and that only a small section of hair at and below the sideburns has been left to grow. Curly hair and bushy mutton chops are a great look as the textures complement each other well. He has also allowed the hair on his chin to grow out slightly. Here we see curly mutton chops that just reach under the jaw line together with stubbly hair on the chin and above the lip. Here neatly trimmed side curtains feed into a full moustache. The moustache has been grown out and hugs the top lip. The only facial hair that has been cultivated are his mutton chops, which just reach under the jaw and are trimmed short. This man’s side whiskers are the same length as the hair on this head – allowing for a neat flowing look across the face. His mutton chops are a medium length and have been combed towards the sides, while his moustache curls onto the edge of his lips. 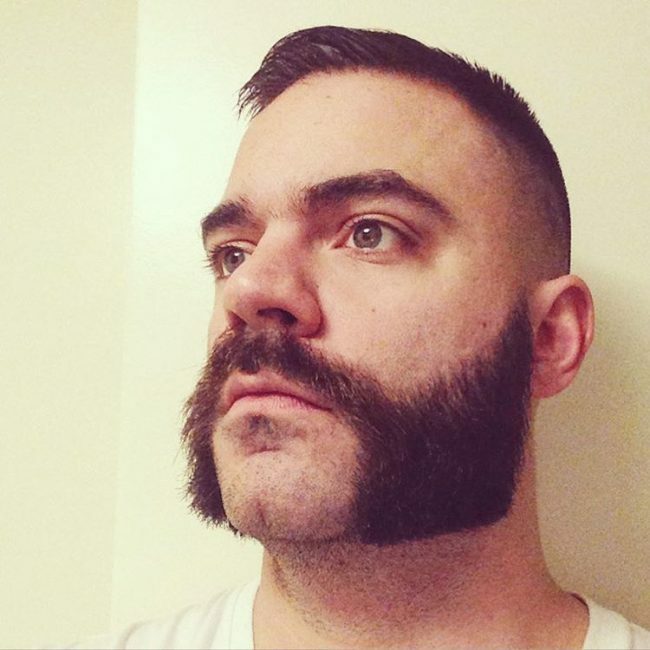 In this picture, the facial hair starts in the sideburns and continues down just along the jaw line before reaching up and joining into the moustache. His beard is quite thick and dark and neatly conceals the lower part of his jaw while the chin is open and the moustache is clipped just above the lip. Here we can see a thin stretch of facial hair grown from the sideburns down to just above the chin. The rest of the face is shaved clean. His squared off mutton chops, upturned moustache, soul patch, and beard are all separated from each other providing a distinguished and smart look. His beard has clean, straight edges which work well with his angular face. There is a slight shadow above his lip and his chin is shaved. Here we see a small patch of side whiskers together with a handlebar moustache. He has kept this hair short, while the rest of his face is clean shaven. His moustache has been split into two clipped sections by shaving the middle portion. His mutton chops sit just on the jaw and match the length of his hair. This beard probably took quite some time to grow and you can see it’s been well maintained. His moustache and mutton chops are combed outwards and then down, where the beard sits on his chest. Mutton chops can look great and this look is perfect for a man with a sharply angled face as they can soften the edges. They look good either long or short providing the facial hair is well maintained and neatly arranged. Mutton chops are no longer a stuffy old style, but definitely chic and fresh again so you can expect to see a lot more side curtains around! 30 Funky Beard without Mustache Styles – Yay or Nay?